I began to study philosophy in earnest when, as a recent college graduate, I became interested in Christian apologetics. In retrospect, I now realize that this was only my formal introduction to the study of philosophy. In fact, I came to think philosophically in a number of other contexts. When I was twelve I picked up a copy of the Penguin edition of The Last Days of Socrates at a garage sale because it had the names "Plato" and "Socrates" on the cover, and they sounded important. I read it and enjoyed it even though I—much like the young men that Socrates so influenced in his time—was drawn to Socrates not because of what he said but because of the beauty of the way he thought. The attraction was seductive rather than simply rational. Or perhaps the very rationality of Socrates was the thing I found so alluring. Something similar hit me in my middle school geometry class when I realized that I wasn't just doing math but learning how to reason. A few years later in college, Professor Pardon Tillinghast gave me my first taste of history that didn't boil down to memorization of names and dates. Tillinghast was a hagiographer, a historiographer, and a philosopher of history. As we read multiple versions of the same historical events, I slowly came to realize that history was not a neutral practice but one charged with purposes, and that the idea of history itself can be studied in its historical development. These courses weren't just training, they were inductions into communities of thought. Looking back on it, I realize now that I came to philosophy through love, and through the practices of communities. It's helpful for me to remember this as I attempt to teach philosophy to my students. It would be a shame to transform the discipline I love and turn it into just a set of propositions and arguments to be memorized for an exam. My hope is that the study of philosophy will inform my students' whole lives, enriching their thinking and giving them tools for solving problems they have not yet even imagined. 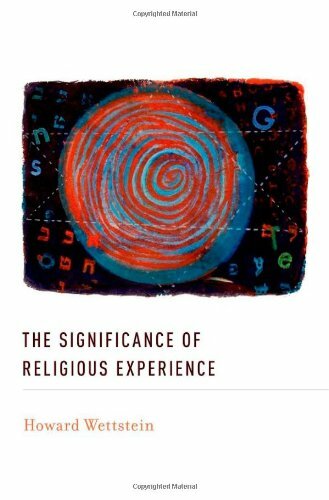 Which brings me to Howard Wettstein's enticing and brilliant new book, The Significance of Religious Experience. Wettstein is a philosopher who hopes to reform philosophy of religion by teaching it to hear the language of the Bible anew. Or perhaps it would be more accurate to say by teaching it to hear the language of the Bible in a very old, pre-philosophical way, and by inviting philosophers of religion to consider religion and religious practices in their native environment and not merely as dessicated lab specimens. I began by thinking that Wettstein and I would have a lot to disagree about, since we belong to such different communities. He is an analytic philosopher, and I am trained in the traditions of European phenomenology and American pragmatism. He's a Wittgenstein scholar with a deep concern with the philosophy of language; I'm a Peirce scholar and really more of a historian of ideas. He's Jewish; I'm Christian. He is a naturalist; I find it hard to dismiss the supernatural. And so on. And yet, as I read this book I kept finding myself nodding my head in deep agreement. My reading notes go beyond my usual summaries of the arguments and are full of bold yeses, questions I'd like to ask Wettstein, lists of books I'd like to discuss with him. Despite our obvious differences, I have the sense that Wettstein and I are working toward the same goal. How could this be? I think the best way to answer that question is to turn not to Wettstein's first chapter, but to his last. The book ends in a way that I'll call confessional, though I should be careful to point out that I don't mean that it gives a profession of faith. I mean it more like Augustine means it: Wettstein ends by reflecting on what he believes, and on what he thinks he can reliably say about that. In this last chapter, Wettstein recounts his own journey and what it has been like telling his friends about his religious views. Early in life he was religious. Later he left religion, and in the most recent stage of life he has returned to religion. He doesn't call himself a believer in God, but he is committed to the religious life of his tradition. Some of his friends who have outgrown their religion are envious of his return to religion and its comforts, but they can't imagine affirming religion because it looks to them like religion is simply false. Others suspect he has bought his return to religion too cheaply: Wettstein gets to pray and attend religious services without having to make a commitment to religious metaphysics. But the most interesting conversation he recounts is one he has with an Orthodox Jewish friend. Wettstein admits to this friend that even though he does not believe in God he still prays. "To my surprise, he was not so sure how far apart we were even on questions of basic theology. The reason was, he said, that he is not at all sure what he is speaking of when he speaks of God, and not at all sure to whom he is speaking when he speaks to God."